One of my favorite things to do as an inn coordinator is to help my guests plan surprises for their significant others. Whether it’s arranging to have breakfast delivered to their cabin in the morning or setting up the a romantic atmosphere with candles and rose petals throughout the cabin, I help plan all sorts of surprises. Our romance package is particularly popular around this time of the year. 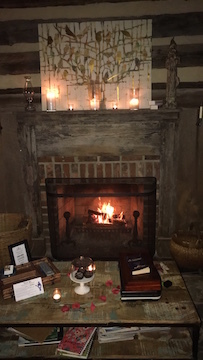 It includes a delicious display of locally made artisan chocolates, a scattering of silk rose petals, the cabin lit by candles, and a wood-burning fire in the fireplace. I was very excited about setting up this particular package since it is FINALLY cold enough to use the fireplaces in the cabins! The wood-burning fire gives all cabins a cozy and romantic feel.